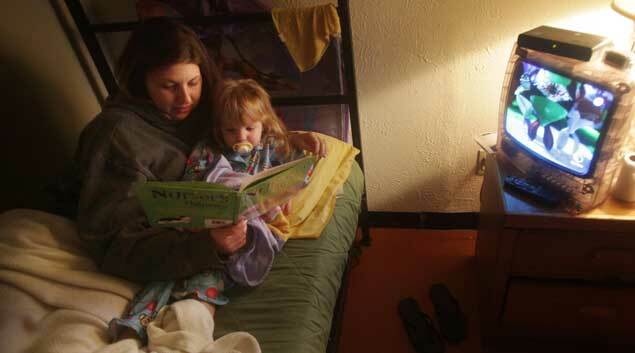 Megan Olmstead reads with her daughter, Chloe, before bed at Center Point therapeutic center in Tulsa on Jan. 17, 2010. Olmstead is the first woman in Oklahoma Department of Corrections history to have her child live with her while still in custody. Olmstead holds a job and plans to be out of Center Point in March 2011. “Good morning ladies,” the women of Center Point greet one another. It’s part of a daily ritual at the house, a transitional living facility north of downtown Tulsa for Oklahoma Department of Corrections inmates who are struggling with substance abuse. The women who live at Center Point have made bad choices: drugs, alcohol, forgery, theft, abusive relationships—exposing their children to their behavior and crimes while under the influence. Some residents at the therapeutic center are on their fourth or fifth prison sentences, for mostly drug-related and nonviolent crimes. Regina Price, the program director everyone calls “Miss Regina,” is trying to teach these women that a history of bad decisions does not doom them to failure. “My concepts for the day are empathy and pride,” one woman tells her roommates on a cold winter morning at the home. The women are sitting in a circle, discussing their thoughts, feelings and concerns as part of their daily therapy. They greet one another, choose a concept or two for the day, talk about what’s on their mind and what they are grateful for, and then share a positive affirmation. Each woman in the house must participate daily in chores and therapy sessions, unless she is further along in the program and can leave during the day for a job or job training. California-based Center Point has drug rehabilitation centers in California, Texas and Louisiana, and contracts for rehab-based department of corrections transitional housing in California and Oklahoma. The Tulsa facility opened in 2007. The women at Center Point’s facility are still technically in Oklahoma Department of Corrections’ custody. But there are no bars, no jail cells. Everyone gets called by her first name, not an inmate number. There were more than 2,700 women in Oklahoma prisons last year, but for the nearly 1,350 who are nonviolent drug offenders, there are only 32 beds at Center Point’s Tulsa facility. Less than 3 percent of those women will get a spot at Center Point, which reports a nearly 100 percent success rate in preventing its graduates from re-offending. It is a yearlong intense therapeutic program in which they attempt to confront and change the behavior and decisions that led to their incarceration. “We have not had any women who’ve completed the program return to prison,” Price said. And for the estimated 46 percent of women inmates in Oklahoma who have children, there’s an important difference: At Center Point, children can stay with their mothers for weekend, overnight visits—or even longer. On this particular morning, chores are finished promptly, grits and toast are devoured by 6:15 a.m., and a small group of the women head to the bus stop to catch routes for jobs or job training. Hailee Bullock has wiped the jelly off 3-year-old Chloe’s face and dressed her for day care because Chloe’s mom, Megan Olmstead, had to be at work before most of the others were awake. Chloe is the first child of an Oklahoma convict to live with her mother while still in Oklahoma Department of Corrections’ custody, a solution proposed by a Department of Human Services caseworker charged with Chloe’s well-being. Chloe’s father’s parental rights were terminated, and her grandmother has an illness that prevents her from being able to care for Chloe full-time. Foster parents cared for Chloe after Olmstead went to prison. But when the Department of Human Services caseworker saw how much progress Olmstead had made at Center Point—getting sober, keeping a job at a hotel—she suggested it would be possible for her to win back custody of Chloe. She could come live at Center Point with her mother. Chloe visited her mom for about six months at Center Point before a judge, and Department of Corrections officials signed off on granting Olmstead custody a few months ago. Her toddler bed sits wedged between the women’s bunk beds and Oklahoma Department of Corrections-issued clear plastic televisions. Bullock, Olmstead’s roommate, helps Chloe get ready for day care each morning and watches her after school until her mother returns from work. But everyone pitches in a little, whether it’s finding Chloe’s missing toys or fixing her peanut butter and jelly sandwiches for a snack after day care. It was at age 26 when Olmstead really needed help. Her world fell apart, and she turned to drugs. She had suffered a miscarriage and was going through a divorce, and her parents’ marriage of 20-plus years fell apart. Two of her best friends died: One was a murder victim, and the other overdosed. She totaled her car, lost her job and started selling meth—and using it. The Edison High School graduate first tried the drug at 15, but only as a casual user at parties, she said. This time, things quickly spiraled out of control. She got clean for a while when Chloe was born but relapsed soon after. In December 2008, Olmstead was serving probation with a five-year deferred sentence for drug possession when she picked up another charge for drug possession. She was out of jail on bond awaiting trial on that charge when the house she was living in was raided by police. Court records show officers found drugs hidden in a diaper bag. Police took Chloe and Tanner, her then-7-year-old son from her first marriage. Olmstead was charged with possession of methamphetamine with intent to distribute, drug paraphernalia and a firearm after former conviction of a felony. Her request for drug court was denied. She was sentenced to six years. Olmstead served seven months at Hillside Community Corrections Center in Oklahoma City, and her sentence was shortened for good behavior. During that time, Chloe was cared for by a family friend, and then Department of Human Services foster parents. Tanner’s father in Houston was granted custody. Olmstead hasn’t seen her son in two years. But getting her kids taken away was the wake-up call she needed to get sober. She never dreamed she’d be able to get Chloe back while still in custody. She can’t wait until she gets out in a few weeks so she can move Chloe and herself in with her mother. Maybe take Chloe to Incredible Pizza. “The ladies hold each other accountable,” Regina Price said. Some stay at Center Point until they are discharged. Some get a global positioning system ankle monitor so they can finish the last few weeks or months of their sentence at home. Roommates Medea Glass and Amy Cassell met while in custody at Oklahoma’s Eddie Warrior Correctional Center in Taft, Oklahoma. They sit by each other in group sessions, work out together and finish each other’s sentences on occasion. Both put on tough-girl facades that sometimes crumble under the weight of the choices they’ve made in life. Both have children that are being cared for by their families while they serve time. Glass received a 10-year suspended sentence for multiple felony charges in Grady County for meth possession, and she had almost completed drug court when she was removed from the program for violating the rules. Her suspended sentence was revoked, and she went to prison. Once she learned about Center Point’s rehab-based program, she fought hard to get there, she said. How does Glass know this time will be different? Her mother is her biggest supporter, but she’s tired of disappointment. “She said, ‘You have an oar, and you’re not paddling — and I’m tired of paddling for you. We really need to know you’re going to do it this time,’ ” Glass said. Cassell was sentenced to five years for multiple felony DUI charges in Tulsa and Pittsburg counties. Her parents want to believe their daughter has changed this time, but past experiences make it hard. The women are sitting in a circle, doing their morning greetings and sharing what they are grateful for. On this morning, they’re frequently reaching for the roll of toilet paper the women keep handy at therapy for drying tears. Sooner or later at Center Point, everyone cries. Even Miss Regina. Glass’ icy blue eyes flash and fill with tears. She is hurt, she is angry, she is giving up hope that the past will ever be different.